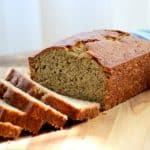 Brown Butter Rum Banana Bread – this is not your mother’s banana bread – it’s made even better with the addition of brown butter and some rum! Shhhh…don’t tell mom! No, we haven’t moved. haha This is a post I’ve decided to update with some new love. It was originally published back in December ’14. I figured it was time. Ok, well not completely, like totally, like a-place-for-everything-and-everything-in-its’-place like moved in, but we are getting there. At least I know we’re NOT going to be moving for AT LEAST another year, maybe two or more if I can help it! I REALLY like this house, the location, the neighbors we’ve met so far AND I can take some pretty great pictures right in the dining room ON my very own kitchen table because of some pretty awesome windows. Obviously though, these pictures were taken in the backyard of our previous rental hence the stone wall background. Honestly though, I cannot tell you how very happy I am. If you aren’t familiar with what’s been happening in my life lately (and that in part, is due to the fact that I haven’t been posting regularly) we moved in the middle of October from the White Mountains of New Hampshire to the desert of Phoenix, Arizona. We are originally from Rhode Island and moved to Arizona back in 2002. After being here for 11 years, we decided that we wanted to return to New England to be closer to family and give mountain living a try. Not the rugged mountain living – we had the luxuries of heat, hot water (when we didn’t run out of both of those – and twice at the same time), indoor plumbing, and even internet! The desire to live in Arizona returned after 14 months of NH living, so we MAJORLY downsized and returned to the West. We lived in a rental for about a month and a half before finally settling in our current home. What a relief, I tell ya! If you’ve ever moved and I’m sure you have, it’s just so unsettling and a pain in the royal tuckus! I like being organized, knowing where my things are in my kitchen and a routine, not this being in a state of flux baloney. I just want to be settled!!! I’m a happier person when I’m settled and isn’t that what the family ultimately wants anyway? A settled momma equals a happy momma. Way back when, I received a Better Homes and Gardens Cookbook as a wedding present and LOVED that thing! I wrote notes in it, even adapted some recipes. I THREW the dang thing out!! Can you believe it?! I have NO idea what came over me. I thought I needed the newer updated version and should discard the old one, but apparently had a MAJOR mind-fart that I suppose was WAY too BIG to be called a mind fart. Lack of judgement, a momentary state of dementia, a lobotomy maybe or all three of those combined? WHY on God’s green earth would I EVER have thrown that thing away????!!!! Odd because I KEPT cookbooks of my mother’s that have no relevance and that I really have no use for. The reason for this story? It had a banana bread recipe that I loved so very much and made quite often. Sadness ensued amongst family members when I no longer had said recipe and couldn’t recall for the life of me what the ingredients were…besides the bananas, of course. 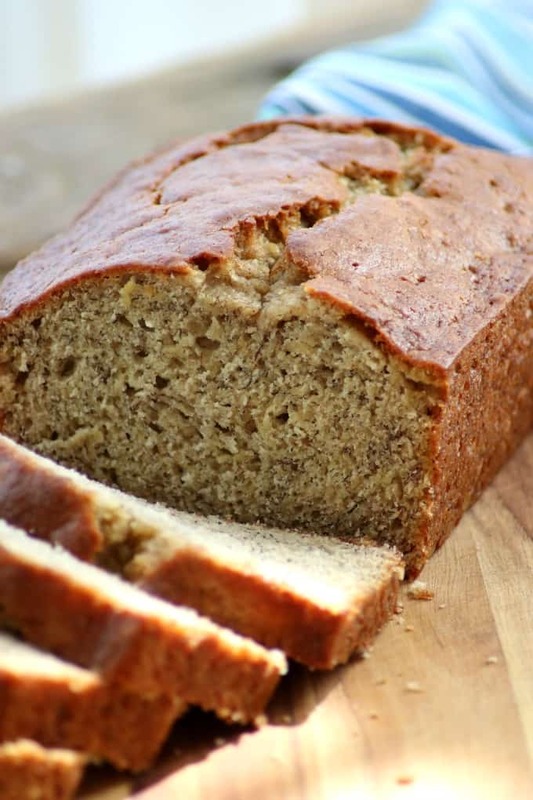 Watch this video of the Brown Butter Rum Banana Bread to see how easily it comes together! So, after perusing the internet, I came upon this recipe at Better Homes and Gardens and added some extra goodness to it. Here’s a great tutorial on how to brown butter if you haven’t done it before. You might also enjoy these other items for breakfast here at 365. These Loaded Huevos Rancheros are the bomb. Seriously! They are SO full of flavor that my son has been asking for them for breakfast almost every weekend. If you like a cinnamon sugar combination, then you’ll love these French Breakfast Puffs. They’re another delicious treat that will be perfect with a cup of coffee or tea! Want to be all fancy for breakfast or at least pretend to be? Make this Lemon Poppy Seed Dutch Baby. You’re sure to impress family and friends. 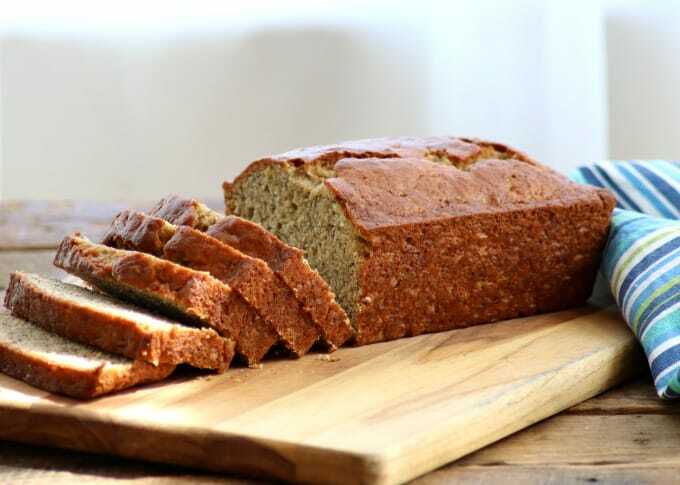 This Brown Butter Rum Banana Bread is intensified with a rich nutty flavor of browned butter and rum. This is not the banana bread grandma used to make! Preheat oven to 350 degrees F. Prepare a 9 X 5-inch bread pan by spraying it on the bottom and less than halfway up on the sides with cooking spray or by greasing it with butter. In a large bowl, whisk together flour, baking powder, baking soda, cinnamon, salt and nutmeg. In a medium bowl, lightly beat the eggs. Mix in the banana and sugar. In a medium skillet over medium heat, melt the butter. Once the butter is melted add the rum to the pan. Continue to cook while stirring constantly. Remove from heat when you see golden bits of butter in the bottom of the pan. Butter / rum will continue to cook slightly once removed, so you don't want it to become too dark while on the stove. You could end up with burnt butter and burnt butter doesn't taste good in anything. The alcohol in the rum will burn off and you will see the butter foam as it cooks. Just continue to gently stir and stay focused on making sure the butter becomes golden to slightly amber in color. This will probably take 5 - 7 minutes. Lower the heat if you feel it is cooking too fast. Add butter / rum mixture to banana mixture and thoroughly incorporate. Add banana mixture all at once to dry ingredients and stir until just mixed. Don't worry, there will probably be some lumps. No biggie. If desired, cover loaf with some tin foil in the last 15 minutes of baking should it begin to darken too much. Remove from oven and place pan on wire rack to cool for 15 minutes. Remove the bread from pan and allow to cool completely on the rack. The bread slices best once it has been wrapped in plastic wrap and left to sit overnight. After making this Brown Butter Rum Banana Bread, I don’t really think you can have enough banana bread recipes. I’m excited to make this 5-Ingredient Flourless Banana Bread. I’m so intrigued by it! I am such a Kahlua lover that I don’t think I’d want to share even a crumb of this Kahlua Banana Bread. Wow! And who doesn’t like a little chocolate with their bananas? This Chocolate Banana Bread made with pudding has me swooning! Literally. I rate everything I make on a scale of 1 -4 and this Brown Butter Rum Banana Bread earned 3 1/2 rolling pins. 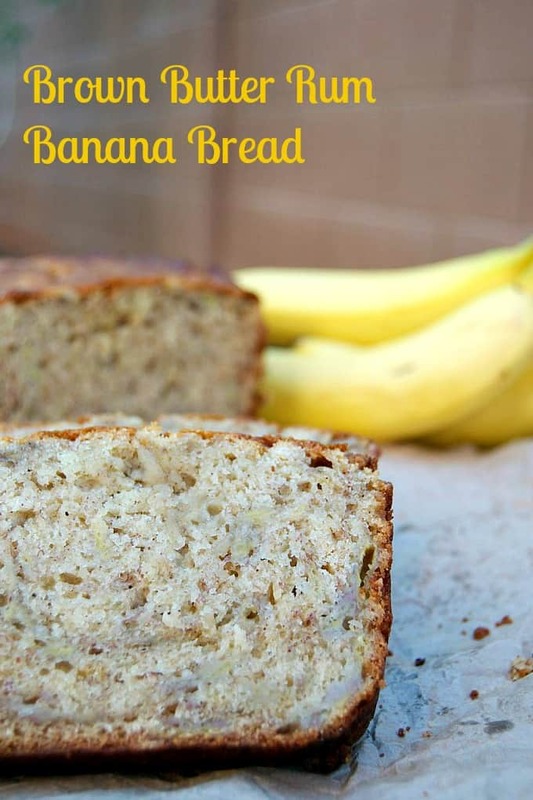 I love this banana bread recipe as is, but making those two little changes, gave it an extra umph! Oh, it was so yummy! I dont have rum but i have rum extract. How much rum extract do you think i shout put? Can you use light rum? I don’t see why you couldn’t Tena. This turned out great for me!!! I did use white whole wheat flour to try and slip in some extra fiber. Great recipe!!! About what year was your BHG Cookbook published? Was it the one with the red plaid cover. I had my mother’s from 1949, but it completely fell apart after only 60 years of hard use. After mom died, each of my sisters and I took some of the loose pages as a memory. I have purchased two others at garage sales. Will have to look up what years if you are interested, I could probably part with one of them, or I could type out recipes you needed. E-mail me if I can help. I found the cookbooks. One is from 1981, the other is quite a bit older, but not as old as my mother’s. I would prefer keeping that one, as it has a lot of the recipes my mom used to make. I bought the second one for my daughter, who thinks it is too old-fashioned. So if you need a 1981 Better Homes and Gardens New Cookbook with the traditional red plaid cover, please let me know. Perhaps we can work something out. I agree, the BHG cookbook was a staple in my Mom’s kitchen and the newer version is missing some of my the best recipes of my childhood. 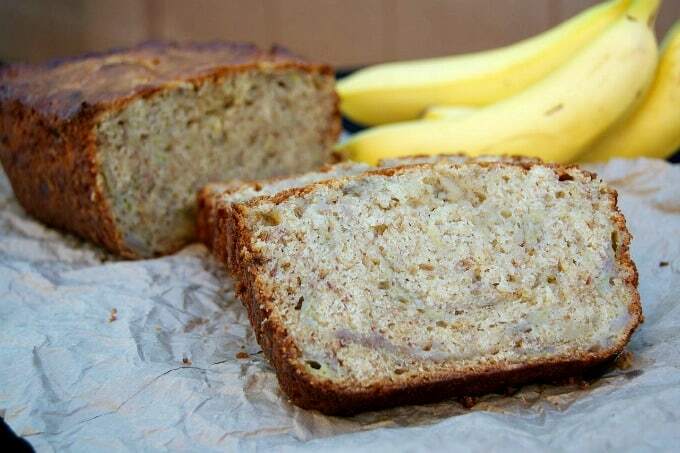 Was looking for a delicious banana bread that I could make after my move from NJ to Denver and this was my winner! I only had black rum on hand which makes browning the butter kinda tricky so I added it at the end and still had a perfect result. My latest attempt I replaced the rum for bourbon, so tasty!! Thank you for all your hard work! I bought a bottle of rum (I can use it for other recipes), and I made this banana bread. It turned out great! Thank you for sharing this recipe. It’s fun to try new things like this. Hi Lynne, thank you so much for posting this recipe! They say that perfection is in simplicity. I think that this recipe is just a good example of that! Can’t wait to cook it, too, now – have a great day! This is seriously one of the most delicious things I’ve ever made. Thank you for sharing your recipe. I used Kerrygold butter and Pyrat rum FYI. Also, I used two very ripe Cavendish bananas and three ripe red bananas. Pure gold. The sweet crunch of the crust is unbelievable. Oh, Jim! That makes me SO very happy to hear that you love it so much. Thank you!! Now I want to make it today with the ripe bananas I have sitting on the counter. Happy to hear about the ingredients you used, too. I’ll have to give them a go next time. Happy Baking!! Just found your blog today and busy checking out your recipes. This bread looks great but I don’t see where the question about using rum extract was answered. That is what I would be using instead of the real thing. So what do you think? Thank you, Rebecca! I’m so happy you found me! Yes, you can substitute the rum extract for the light rum in the recipe. I found this link on the McCormick site: https://www.mccormick.com/spices-and-flavors/extracts-and-food-colors/extracts/rum-extract. They say to 1/2 teaspoon of extract for each tablespoon of light rum or 1 1/2 teaspoons rum extract for each tablespoon of dark rum. Therefore, you’ll need 16 teaspoons of the extract to equal the amount of rum used in the recipe. Hope that helps! Made this yesterday and reduced the sugar andd still llovely thank you for an exceptional banana bread recipe. Thank you so much, Priscilla! I’m so glad you enjoyed it and appreciate you letting me know! Hello, please how long does this bread keep for? Prisca, I wouldn’t keep it longer for more than four days. Make sure it’s wrapped well in plastic wrap and store it in the refrigerator. When I make it, we always eat it within the following two days, but I think four would be adequate. YOu could also freeze it and then thaw it in the refrigerator before serving the next day.